Rugby League: News, reports and more. Dons’ boss Paul Cooke praised his players’ spirit after they came close to snatching an unlikely victory in their opening Championship clash against London Broncos at The Hive. Trailing 26-0 against the the relegated Super League side early in the second half, the Dons scored four tries without reply to close the gap to just four points at the end. “I’m proud of the boys and I know what I’m going to get from them and I know I’m going to get that kind of commitment every single week and to a man they are a credit and I’m proud of every one of them,” said Cooke. “But what we have got to do is to come up with some answers to the early part of the game, “ added Cooke. Cooke, who fielded three players from Hull FC in his starting line-up to cover for injuries, plans to mount a spying mission on Sunday’s opponents Featherstone Rovers tonight. 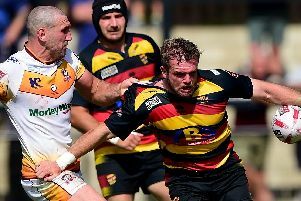 With their Post Office Road ground still not ready to host a game following a pitch extension, their home game against Hunslet is being staged at Wakefield Trinity’s Belle Vue ground. Rovers, who have been busy recruiting players during the close season after finishing runners-up to Leigh last season, are expected to be one of the teams challenging for a top-four spot again this season.